New settings in the Format panel allow you to rotate and flip just about any widget, including sections! You can even rotate widgets in 3D space by using X- and Y- rotation along with perspective. To add interactivity, use Actions to rotate widgets in response to a user event like Click or Swipe. 3. 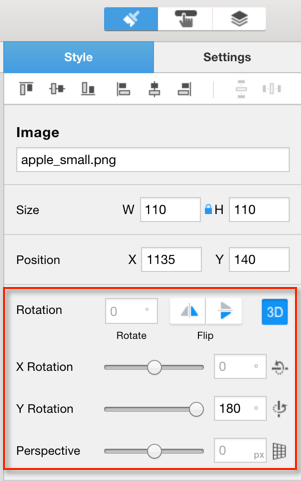 Select the Rotation options to rotate/flip. Here's a short clip on how to rotate elements in 2D & 3D. Rotation can make some super effects. Check out this card flip effect using a Rotate action. How about a book page turn? Use your imagination to create stunning effects!